For most artists, at least part of the impulse to create is to say something to the world. But for watercolorist Paula Christen, painting is not a one-way communication, but an opening to a dialogue. So while Christen incorporates details that welcome the viewer into her paintings, she is careful not to crowd out the viewer’s own associations. 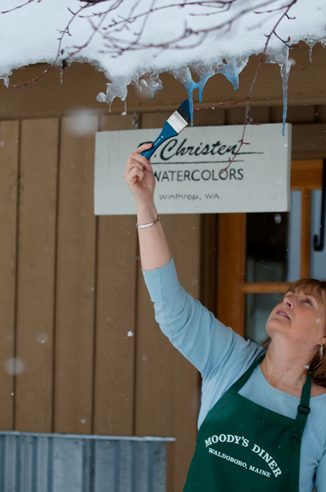 Although virtually everything Christen paints is rooted in nature, she usually includes a suggestion of the human imprint on the environment, whether it’s a fence line, farm equipment, or even a dog. Those elements function on more than one level. The viewer can imagine meandering along a path, literally entering the world of the painting. But that path is also a compositional element, guiding the viewer from one focal point to another. “People like stories,” she said. “They want to own the painting—and they want to own the story.” Christen recalled a woman who was looking at her painting of a farm scene. The woman told her it reminded her of collecting eggs, still warm from the hens, on her grandmother’s farm when she was 6. “Even though there were no chickens in that painting, it pulled that out of her memory and made that connection for her,” said Christen. Christen also wants her art be a place of relaxation for others. When she paints skiers, for example, she depicts people enjoying being in nature and communicating with each other. “You can’t have a phone to your ear—you have to hold the ski pole,” she said. Looking around her Winthrop studio, you can imagine accompanying Christen on a tour of familiar and exotic places as the seasons change. There are simple, daily scenes of outdoor cafés, farmers’ markets, haying, and fishing, as well as paintings that transport you to alpine lakes or to a bluff overlooking the Mediterranean. “Wherever I’m at—if I know I have time to look around—I can usually find something to paint,” she said. Christen has a life-long connection with nature, shaped by childhood of hiking, camping and skiing. She went to high school in Entiat, where there were just 26 students in her graduating class and no art program. So college was an indulgence, a place to soak up virtually every type of art—from charcoal drawing and ceramics to painting and printmaking. She ended up specializing in oil and acrylic painting. “Color is fun—the hero,” Christen admits. 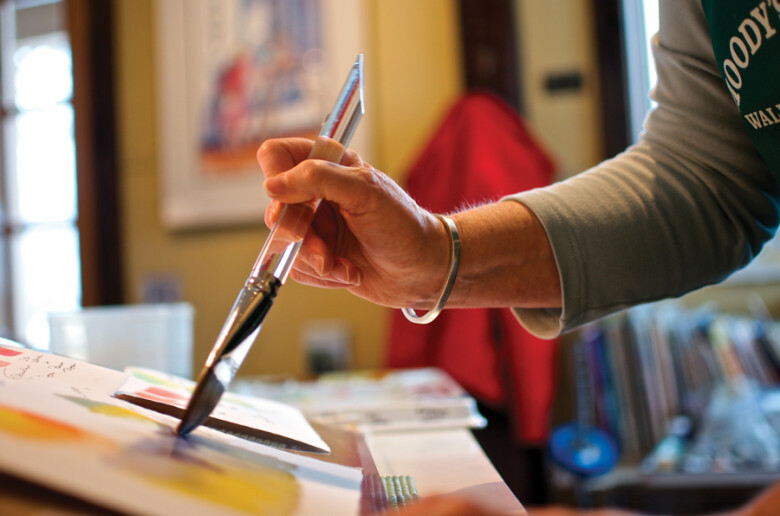 After college, the demands of making a living turned into a 20-year hiatus from art. She picked art up again when she and a friend ran a screen-printing business and people wanted logos and designs for t-shirts. She also dabbled in watercolor but, without a good foundation, found it discouraging. Everything changed when she enrolled in a class, where the teacher was laughing and having fun as he painted. Christen realized watercolors didn’t have to be hard. Since then, Christen has found a way to express in watercolor what she couldn’t in oils or acrylics. Her paintings have an evanescent, translucent quality, but the colors are lush and there are frequent flashes of vibrancy. Christen is not afraid to define edges or play with stark contrasts. “The thing that says sun is great shadows—as big as you can make them, as long as you can,” said Christen, pointing to a sun-washed scene on the southern coast of England. Christen swears by value sketches, quick pencil drawings that help her plan areas of light and dark and determine the focal point and composition. While planning is important in most painting—with the possible exception of abstract expressionism—it is essential with watercolors, where you can’t simply paint over something that didn’t work. Christen said her students are often intimidated by the value sketch and want to move straight to color. Christen often uses a simple palette of just three colors, which she mixes to achieve different shades and values. 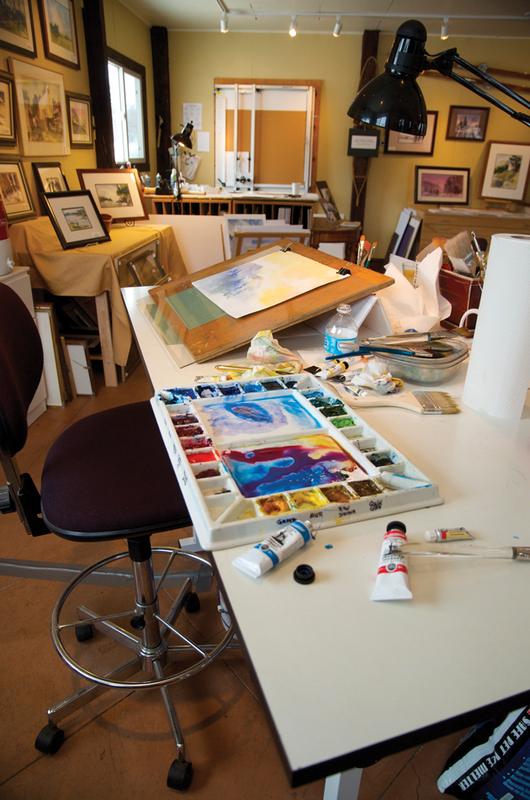 In her studio, she has a chart blending every blue and yellow pigment she had to see how many greens she could make. Among the 56 swatches, you can find the first cottonwood leaves in spring and the deep shadows of pine branches at the end of the day. Her task is finding a way to make all the greens in a landscape interesting, she said. 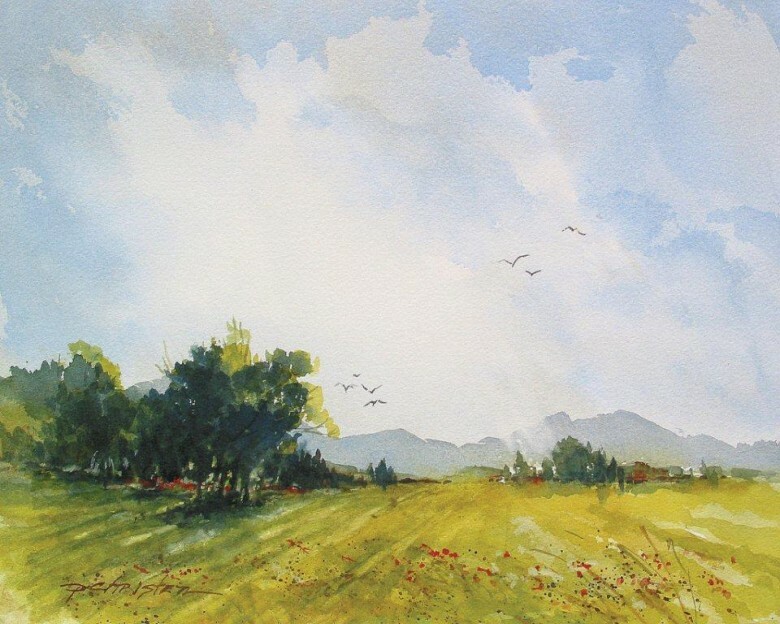 Christen ordinarily paints on dry paper, but when she wants soft, fuzzy edges and minimal detail, she uses the wet-on-wet technique. That technique served her well for a late-winter scene called Seed Catalog Season, where even the reflected puddles on the muddy road look inviting. She also specializes in teaching people who have always wanted to paint but never had the time, or who put their painting aside years ago. 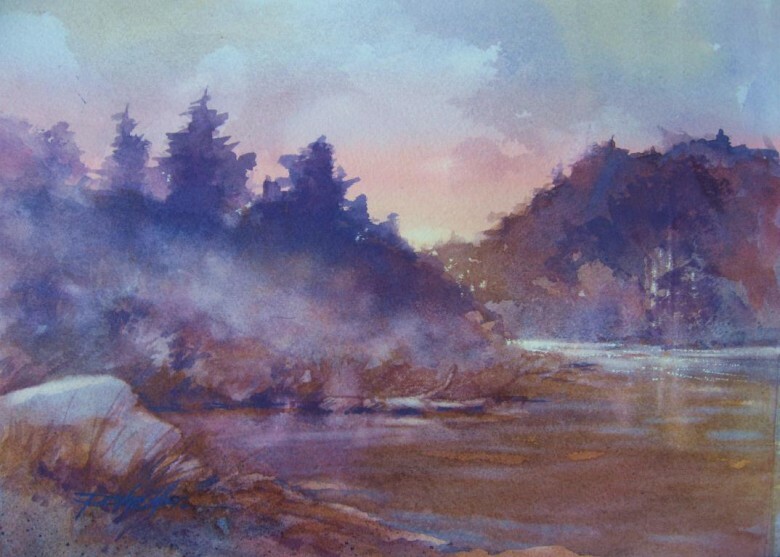 In just four hours, her students learn to produce the whole array of colors from three basic pigments and walk out with a finished, framed watercolor. “It’s what I wish somebody had done for me,” she said. “I want people to know that, no matter when you gave it up, if you have the slightest desire to do whatever brought you that joy, it’s never too late,” she said. Christen has been featured in many local and regional exhibits. Her paintings of ski trails were featured in Cross Country Skier magazine, including her inviting scene of a skier and his dog that was chosen for the cover of the January/February 2014 issue. Find out more about Paula on her artist page: CLICK HERE. 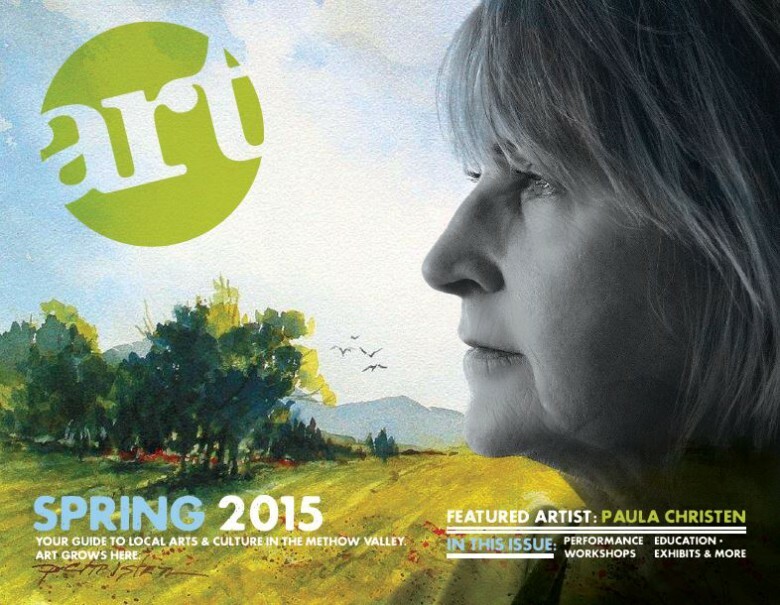 Read the full Spring 2015 Issue online.